India’s leading two wheeler manufacturing company Bajaj Auto has confirmed to launch its RE 60 Quadricyle sometimes during the month of October 2014. According to company sources the quadricyle has gone for production at company’s production plant located at Aurangabad. The auto maker had showcased the quadricyle during the Indian Auto Expo 2014.The quadricylce receives 216cc liquid cooled, four valve, fuel injected engine with triple spark and powered by petrol engine. It is speculated to be offered in both LPG and CNG variants. The engine would be coated with five speed manual transmission system. The engine will develop the power of 18 bhp and deliver an average of 30-35 kms per litre. The upcoming quadricycle in being introduced in Indian car market after receiving the consent from Ministry of Road and Transport, Government of India, allowing the transport of quadricyle on Indian roads from October this year. At present the quadricyle in under test drive. 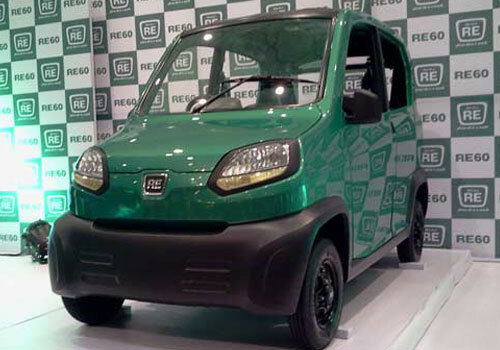 Click here to know about the expected features of Bajaj RE 60.